While I'm a gal about fashion, I'm also extremely passionate about home decor, I'm always looking for new ways to update my (er, our) look. Be it bold paint colors, printed floor pillows or lots of vintage I feel like I'm always inspired to try new things. And while I'd love to go for delicate and whimsy pieces with my decor choices they just don't work with rambunctious toddlers at this point in our life. However, there is one place where I have decor freedom and that's my kitchen. Now, I'm pretty serious about my kitchen, it has to inspire me otherwise I get in cooking ruts and want order a takeout everyday. So when I got the chance to team up with Delta Faucet to give my sink a facelift I immediately jumped on the opportunity and decided it was time to touch up my entire kitchen. 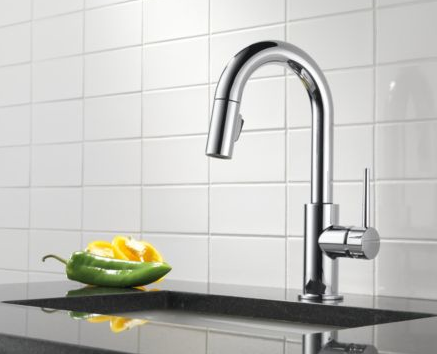 I started off by using Delta's discovery tool, and found that I was in desperate need of a modern sleek, euro inspired faucet to brighten my kitchen, so I opted for the Trinsic. It's fab, right? Now, what I'm especially loving about these is the Touch20 Technology (much like a smartphone), a simple tap anywhere on the faucet spout, hub or handle turns the water on - so you don't have to worry about messy hands getting all over the faucet, making life so much easier. Trust me I have enough messes to deal with, it's the little things. Disclosure: Compensation was provided by Delta via Glam Media. The opinions expressed herein are those of the author and are not indicative of the opinions or positions of Delta.